Side note: Shaun is the ice-tea hammer down champ. He drank a whole glass in 5 seconds! 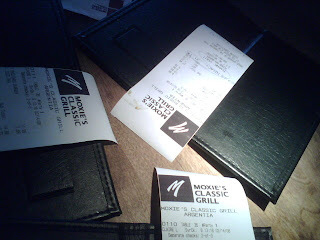 Our delicious lunch finally comes to an end and Shaun asks for the bill: "Uh...could we get it in 3 seperate pieces?" (SHAMITY EVENT #3) WTF??? Since when does Team ID split a bill?? Chris and I are baffled by this "outrageous" display of shamity. Chris is outraged and says "Geez now the waitress is going to think we're co-workers and not friends" Thus the title for my blog entry. I'm calling on all Team ID members. We need an intervention!!! We need to send him to shamity boot camp!!! I've had enough. My proposal is this. If we witness any shamity from Shaun we need to inflict pain - flick him in the ear, slap him in the face, kick him in the shins, thread his eyebrows...whatever!!! We have been unsuccessful in defeating this monster called Shamity. The only solution is to beat it out of Shaun. Hopefully one day we call each other friends again.